“In two thousand years, I will remember none of this. But I will be reborn again here. Congratulations! 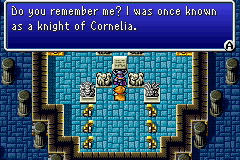 You’ve compled the first Final Fantasy! Once you have completed everything else you want to do, it’s time to head to the final showdown. Hop in your airship and head for the Temple of Fiends (where you rescued Princess Sarah at the beginning of the game). 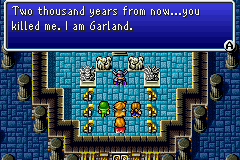 Once inside of the Temple, head straight north into the chamber where you fought Garland. Step on the teleporter and travel back in time 2000 years. You are still in the Chaos Shrine, but now things are a little bit different. The enemies are a lot stronger and the layout has changed drastically. Use the maps above for guidance and proceed into the depths. There is only one treasure chest in the entire Shrine, and it contains the best weapon in the game. It’s on the second to last floor, so don’t worry about missing anything until then. On floor 3F, you will come to a room that is set up in a very familiar fashion. By now you should know that there is going to be a laired monster in front of the passage forward. In this situation it is a Death Eye, which is just a stronger version of the Eye you fought in the Cavern of Ice. No real strategy is needed here; just hit it until it dies. The only complications you might have are if the Death Eye decides to use an instant death attack. After the Death Eye is defeated, you will finally have a use for that stupid Lute you have been carrying around since the beginning of the game. Much like how the Chime granted you access in the Mirage Tower, the Lute will allow you to access the depths of the Chaos Shrine. After playing some music, proceed onwards. Once known, or will be known? Use the maps and continue onwards until you reach B1. Starting on B1, and continuing until the end of the Shrine, you will be battling each of the four Fiends again: Lich on B1, Marilith on B2, Kraken on B3, and Tiamat on B4. On each of these floors you will be battling the monsters that you found in each of the Fiends respective dungeons. The strategies used on each of these bosses are going to be very similar to the strategy used earlier in the game. Each of the Fiends is stronger now, but then again, so are you. Make sure to heal and save before going into battle, as you might get hurt more than expected if you luck runs south. I kill you, you kill me… We’re all a happy family? On floor B4, be sure to head to the room in the southeast corner. There you will find the Masamune, the strongest weapon in the game (outside of the Soul of Chaos). It can be equipped by anyone. A lot of people like to give the Masamune to their White Wizard, as he is the only character to not have a powerful end-game weapon, but I think that is foolish. The Knight should not get the Masamune, as he has the Excalibur. The Master is much better off with his hands. The Black and White Wizards should not be attacking anymore during the game (they will be using curing spells and casting Haste), so that leaves the Ninja and Red Wizard. Depending on the makeup of you party, I would give the Masamune to the Ninja first, then Red Wizard second. 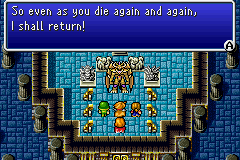 Once you have defeated Tiamat for the second time (or is it the first? Time travel is tricky that way). Head down the final staircase and prepare for the battle with Chaos! 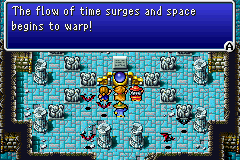 Compared to most time travel plots in video games, this one isn’t half bad. 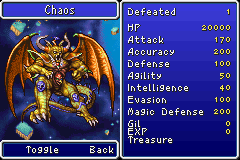 The hardest part about this fight is that Chaos has the spell Curaja, and he’s not afraid to use it. Your goal should be to make sure that you deal more than 9999 damage between castings. With the equipment we have gathered thus far, plus Haste, you shouldn’t have a problem. Chaos knows attack spells from all three elements, plus Flare, so Nulall is going to be very useful. If you don’t have a White Wizard (which I typically don’t) then have two characters focus on healing, while the other two focus on attacking. Haste the Master first, then your other main attacker. Compared to the ordeal of reaching him, Chaos isn’t too difficult. 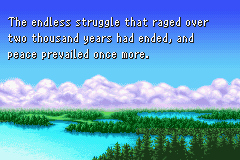 Once Chaos is defeated, you will get to view the final cut-scene, and the game will end. If you haven’t talked to all the NPC’s, then the ending might not make much sense, but if you have, then I think it ties things together nicely. Thank you for using my walkthrough for this game. If you have any questions or insights, please let me know. I have done my best to proofread all 13 Chapters for spelling and grammar, but sometimes something slips through. Also, if a sequence or event seems unclear, let me know. I have played this game so many times over the years that it’s hard to look at things from the perspective of someone who hasn’t.